ERP-Scale is compatible with USB scales which support the HID POS interface protocol. Click on the menu option Test. Click on “Simulate”. If the test is successful, you should see the weight from the scale displayed. You can now update the SapScaleServer. 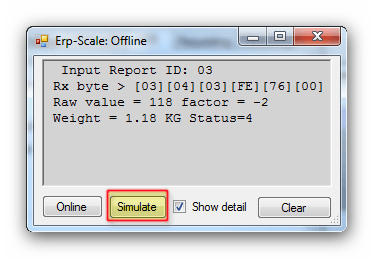 If the correct weight is not displayed, please ensure “Show detail” is ticked and click “Simulate” again. Then copy the text from the window (CTRL-A, CTRL-C) and paste it into an email, together with the weight and unit of measure which should be displayed, and send it to us. If possible, please also test if a negative weight on the scale is displayed correctly. 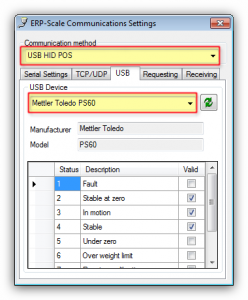 Integrating Modbus devices using ERP-Scale How do we upgrade from scale_for_r3 to ERP-Scale?